Older generations have the privilege and responsibility of helping to prepare younger generations to fulfill their God-given purposes. In part 7 of Chronicles: God’s Mercy and Faithfulness Overcomes, Pastor Dan Cox reads from 1 Chronicles 22-29. Pride brings God’s judgment, but repentance brings His forgiveness and mercy. In part 6 of Chronicles: God’s Mercy and Faithfulness Overcomes, Pastor Dan Cox reads from 1 Chronicles 20 & 21. None of us deserves God’s great blessings, so all of us should live in obedience and gratitude. In part 5 of Chronicles: God’s Mercy and Faithfulness Overcomes, Pastor Dan Cox reads from 1 Chronicles 17. Worthy worship is obedient, joyful, sacrificial and grateful. In part 4 of Chronicles: God’s Mercy and Faithfulness Overcomes, Pastor Dan Cox reads from 1 Chronicles 15 & 16. God’s holiness is not to be treated carelessly. In part 3 of Chronicles: God’s Mercy and Faithfulness Overcomes, Pastor Dan Cox reads from 1 Chronicles 13:1-14. David, while far from perfect, illustrates the blessings of obedience: victory in battle, a kingdom given and eternal blessing. 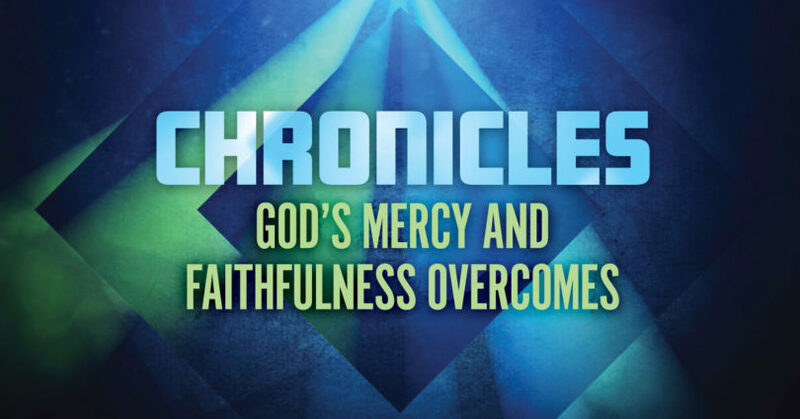 In part 2 of Chronicles: God’s Mercy and Faithfulness Overcomes, Pastor Dan Cox reads from 1 Chronicles 11:1-9. Saul’s life illustrates the dangers of disobedience: humiliating defeat, a lost kingdom and a lost life. In part 1 of Chronicles: God’s Mercy and Faithfulness Overcomes, Pastor Dan Cox reads from 1 Chronicles 10. Debt holds us from God’s will and what He has called us to do. How can we be a blessing to others if we need every penny we have to cover our debts? Guest speaker Dennis Northern talks about ownership, tithing, debt, contentment, and shares his own debt testimony. Dennis Northern reads from 1 Chronicles 29:11-12, Proverbs 3:3-10, and Romans 13:8.